What does a GTD Mission Trip look like??? GTD's Mission Program is made up of short term mission trips focused on reaching out with the love of Christ to those less fortunate. Each trip lasts 3-14 days and is centered around community outreach & service projects. 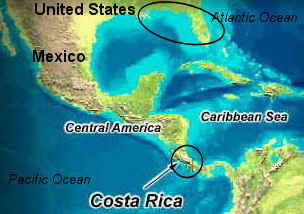 Currently GTD offers domestic mission trips to hurricane affected areas and international mission trips to Costa Rica. Our Costa Rica project is an exciting multiyear endeavor highlighted by our construction projects that will eventually include an orphanage, medical center, fish farm, distribution center, and GTD's MOAB (Mission & Outdoor Adventure Base). And, of course, it wouldn't be a GTD event without thrilling adventures during your free time. Sign up today to be a part of GTD's missions program. And please check our ADOPT-A-NEED list for current supply needs. Mission Trips during our slow season can be available upon request and may require an additional fee. and adversely affected areas in southeastern United States. OUR SLOW SEASONS (THIS USUALLY REQUIRES AN ADDITIONAL FEE). Throughout the year GTD provides 2-3 PUBLIC Mission Trips that are open to the general public. PUBLIC PUBLIC Mission Trips are great ways for individuals or small groups (less than 10) to experience a life changing mission trip at an affordable rate. PUBLIC Mission Trips allow for individuals to participate without needing a sponsoring organization to reserve a trip. Below are 2 public events provided through our Missions Program. You can find an incredible PUBLIC event that fits your level of adventure by clicking onto our UPCOMING EVENTS link. GTD Mission Trips can be reserved for groups of 10 participants or more. GTD will plan, prepare, and provide a custom made mission trip for your group! A PRIVATE Mission Trip lasts 7-14 days and includes: Full time GTD mission guides, local guides, translators, accommodations during trip, all breakfasts, lunches, and dinners in Costa Rica (except at airports) as well as some snacks, mission projects & included activities, ground transportation & fuel within Costa Rica, GTD Missions t-shirt, travel medical insurance, devotionals, optional activities booked in advance, and the trip of a lifetime! TYPES OF GROUPS: GTD offers Mission Trips to all types of groups such as church groups, youth groups (children, middle & high school ages), Sunday school groups, athletic groups, sport's teams, college groups, young adult groups, adult groups, retired groups, men's groups, women's groups, couples, families, leadership, businesses & more. MISSION PROJECTS TO CHOOSE FROM: Construction, work projects, carnival day for kids, VBS, community service, outreach projects, evangelism, sports & recreational outreach, Spanish/English lessons. MOST POPULAR PRIVATE ADVENTURE TRIP: Our most popular Mission Trip for private groups is an 8 day trip consisting of local church attendance, contruction projects, carnival day for kids, community interaction, ziplining in the Rain Forest, Thermal Mania (natural hot springs), and beach day. ALSO INCLUDED AT NO EXTRA CHARGE: GTD provides a memorable trip to nearby Thermal Mania where participants will enjoy a delicious Costa Rican dinner, a waterslide, and a few hours of swimming in pools heated by a local volcano. After a few days of physically demanding work and a few nights of sleep depravation Thermal Mania nights are nothing less than refreshingly special. *MISSION PROJECTS may consist of one or more of the following: construction, manual labor, community service, drug rehab, evangelism, prayer walks, conferences, outreaches. **CULTURAL TOURS consist of field trips to local farms, businesses, and places of interest to see how the local community operates in order to function & sustain life. Tours may include a coffee making tour, sugar making tour, petroglyph (rock engraving) tour, geothermal energy plant tour, fish farm tour, and/or other tours. Full time GTD mission guides, local guides, translators, accommodations during trip, all breakfasts, lunches, and dinners in Costa Rica (except at airports) as well as some snacks, mission projects & included activities, ground transportation & fuel within Costa Rica, GTD Missions t-shirt, travel medical insurance, devotionals, optional activities booked in advance, and the trip of a lifetime! Air travel arrangements, airfare, construction costs (if applicable), transportation to/from home airport, meals at airports, Costa Rica airport exit tax, trip cancellation insurance, any gratuities for local guides, unscheduled snacks, souvenirs, optional activities not booked in advance and any costs incurred by lost or stolen passports.